The Pi'pa (balloon guitar) is a stringed musical instrument that gives out melancholy sound like the voice of the chilin. They rythm produces thought of purity and fidelity and awakens determination of the mind. When the heaven hears the sound of the pi'pa, it clears the thoughts and increases concentration. When the earth hears the sound of the pi'pa, it cleanses the space to provide good vibes, invite good luck and protect against unwanted bad happenings. Many deities and chinese fairy angels mastered skills of pi'pa to create magical auras and use as weapons to subdue evil. One of the Four Heavenly Kings named Mo Li Hai has the Pi'pa as his weapon to put evil forces to rest. Pi'pa also connotes the pi yao working hard to invite wealth into ones home. This is because "pi" has the same sound as pi yao's "pi". And "pa" means the ox working hard in the farm. 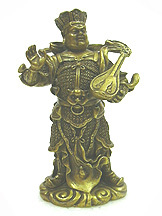 Displaying the pi'pa at home will immediately lighten choking energies, deflect negativities, bring calmness and favour the luck of the partriarch and martriarch. This pi'pa is hand made from fine wood with excellent craftmanship that is guaranteed to impress. It comes with a free stand and instrument casing. 1. Place the Magical Pi'pa in the center of your living room, dining room or entire house to bring in good fortune, prosperity, good health and happiness for the entire family. 2. One can also display this cure in sectors where there are violent stars or where good stars meeting the bad stars. The magical pi'pa will be able to control the evil energy of the bad stars to prevent losses in finance/health/happiness and at the same time harvest opportunity in the good stars. 3. One can display on the workdesk or by the bed if one feels depressed, gets angry easily, experiences stress and being put on by a lot of depression. Let the magical pi'pa make wonders to calm your nerves down. 4. The Magical Pi'pal can also be displayed facing your maindoor or in the vicinity of the maindoor inside the house to gather positive energy, expel evil energy, dissipate mishaps and avoid natural disasters. Mo Li Hai uses the Pi'pa as weapon the put evil to rest.